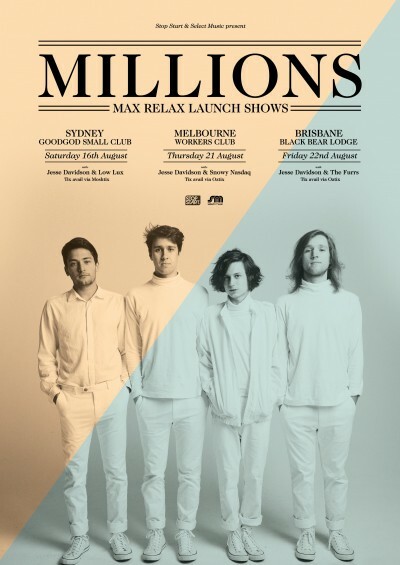 Brisbane’s Millions are proud to present their debut record ‘Max Relax’ and announce a national tour to boot, including a Saturday night throwdown in the Goodgod Danceteria! Decamping in London late 2013 the band crafted the record they’d spent so long working towards and dreaming about. To get the album in shape, they enlisted UK legend Glenn Tilbrook as producer. Not only a founder of 1980’s Brit hitmakers Squeeze (“Cool For Cats, Pulling Mussels (From the Shell), Up The Junction”) but also the father of Millions’ guitarist Ted and drummer Louis, Glenn and the band spent six weeks tracking and mixing at his own 45RPM Studios in Greenwich. While there, Millions managed to sneak in a few UK gigs, including a dream-come-true support slot for Babyshambles. Now, the album is ready, and the stage awaits. Grab yr tix now.